Real Madrid authentic third jersey for the 2018/19 season. Branded Adidas product in the limited authentic version (code: CG0561). The jersey is identical to those in which players actually play. See the cheaper replica version. The jersey was created in cooperation with the Parley for the Oceans program, which focuses its efforts on the protection of oceans natural environment. Polyester used for production comes from waste off of coasts and beaches. The inscription on the collar as well as at the bottom of the shirt are intended to emphasize the commitment to the cause of environmental protection. The production uses ClimaChill technology which is designed to extract moisture from the skins surface and provide a comfortable fit to any supporter that wears it. Show support for Real Madrid and join the cause to save the oceans! 1. Authentic (manufacturer code: DP5441) - you are currently viewMatch version, identical to the one in which players actually appear. During production, the most emphasis was on airiness and lightness. The weight of the material is slightly lower than in other versions, so the shirt is not as mechanically durable. Additional vents are added on more than half of its surface, the shirt deals perfectly with moisture and dries very quickly - this is due to the use of ClimaChill technology. The fitted cut allows maximum freedom of movement. 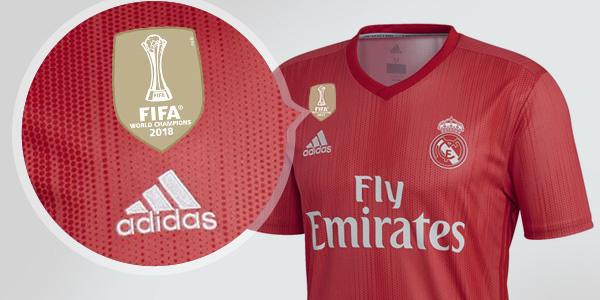 The club badge and the Adidas logo are pressed to reduce the weight of the shirt. 2. Replica (manufacturer code: DP5445). List price: 89.95 €. The version specially designed for fans. The emphasis is on endurance and comfort. The greater grammage of the material ensures a long life of the jersey, the standard cut provides comfort while wearing. In this version, the club badge and manufacturer logo are sewn on. The use of standard technologies such as ClimaLite make the jersey excellently protected from moisture..